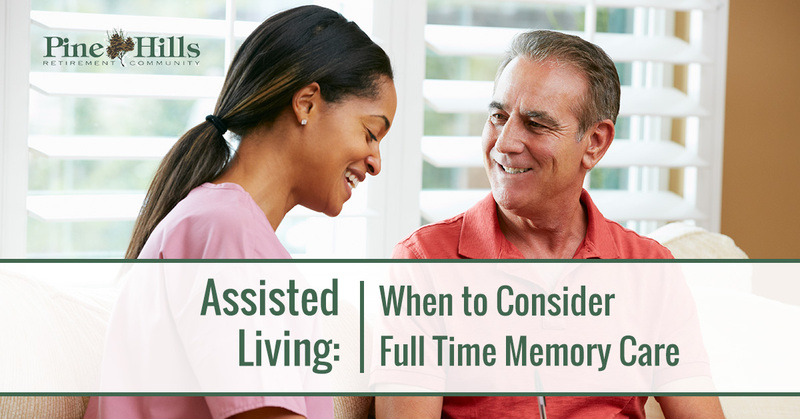 If your spouse, parent or other loved one is suffering from Alzheimer’s or some other type of dementia, it can be difficult to know when to consider moving them from assisted living to full-time memory care. You don’t want to steal their last few years of independence from them. But, even more importantly, you don’t want to put them in danger. And, when someone loses their ability to care for themselves, they are in danger of injury, illness, unnecessary emotional and mental distress, and death. Systems and equipment specifically designed to make living easier for people with memory and cognition issues. Memory care facilities are not scary places. They are safe places for people who need extra help to stay safe. You are worried all the time: Your loved one falls frequently, is easily confused, or has become lost while not far from home. You are exhausted: Caregiving has become too much for you and others to handle on your own. Poor health: Your loved one has stopped taking care of themselves, their daily health needs, and personal hygiene. Physical changes: Your loved one has suddenly changed the way they walk and move, become tentative, appearing to be unsure of their surroundings, and lacking awareness of their personal space and surroundings. Uncontrolled spending: A frequent sign that someone needs full time memory care is uncontrolled purchasing of duplicate items or hoarding. If your loved one is unable to remember that they’ll be moving to a memory care facility, making regular visits to the facility prior to the move can be helpful. If they have some familiarity with their new surroundings before moving in full time, it will help them make the transition. One of the toughest parts of this transition is the impact it takes on caregivers. Feelings of guilt or failure can take a toll. If you are a caretaker and are having trouble coping, seek out resources from the Alzheimer’s Association that are available specifically for caregivers. If you think memory care is in your loved one’s future, visit several facilities. Or, ideally, make sure that they are in a good place before they need memory care. At places like Pine Hills Retirement Community, retirees can move from independent living, to assisted living, and into locked memory care, without relocating or leaving everything they know behind. We hope you’ll give us a call to learn more about assisted living and memory care at Pine Hills.